I came across this product unintentionally in our local Clicks Pharmacy and couldn’t resist buying it because it was so cheap (just over $1/10 pula for a 200ml tube). You rarely see Pantene products at that affordable price! After I was done staring at it in disbelief (I even asked a store attendant just to make sure the price was correct) I bought two and gleefully took them home. 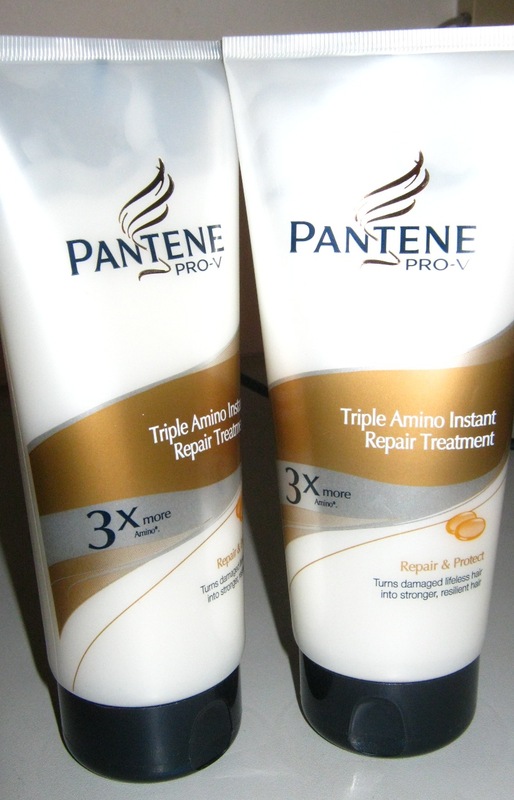 Pantene Pro-V’s claim to fame is that it contains 3 times more aminos than regular Pantene Intensive treatments and therefore does a better job of repairing damaged hair and protecting your hair from damage as well. The key ingredients are the amino acids and according to my “research”, amino acids help improve moisturizing capacity, make de-tangling easier, help close the hair cuticle thus preventing frizz and making the hair silky and strengthen, rebuild & nourish chemically damaged hair without weighing it down or causing buildup. On wash day I used the Pantene Pro-V treatment in place of conditioner. I left it on for just over 2 hours though that is not required. The instructions state that 5-10 minutes is sufficient however I deep condition out of habit now. I applied the treatment, threw on a shower cap and went off to do other things. I rinsed it out and the results were positively amazing! My hair was very happy! The perfect balance of soft and silky. The V05 conditioner makes my hair extremely soft, Schwarzkopf makes it very silky but Pantene Pro-V treatment does both equally well. It’s also quite light unlike V05 which is a little thick and heavy on the hair. It doesn’t need to be followed by a conditioner because from what I can tell it pretty much does the same thing as conditioners. However it would also work well if mixed with a conditioner. I loved it so much I went right back to Clicks when I could to get the last tube on the shelf! Makes hair silky and soft at the same time. This has been the most balanced treatment I have come across for my hair. And if it stays at it’s current price, it will definitely become a regular product for me. I really loved that product too, but they haven’t sold it for a really long time. Have you found any products that have the same effect on hair since then?